Moses desire for God’s Presence and God’s will is the standard for anyone who would be a servant of Jesus Christ the Messiah. Yet His Presence alone (nor the blessing which come with it) is never enough, as the follower of God desires others to experience the fullness of God as well. Today we will examine three more lessons from Moses experience with the LORD in Exodus 33. In these two verses we see exactly what is described in the paragraph above. Moses, emboldened by God’s answering his pleas in the affirmative, wants more still. He wants more of God’s Glory, more of His grace, more of His love, and more of His power. He does not want more of God because he wants to have prestige among men, or riches or wealth. He wants more of God because Moses has tasted and seen that God is more than good, His words are more than sweet, His Presence more necessary to him than air. Moses has become a God fixated, God intoxicated man, and nothing more than God Himself with satisfy His soul. Like David after himself, Moses would say “My soul thirsts for you, my flesh cries out for You, as a man in a desert with no water” (Psalm 63). I believe this at the heart of every true follower of Christ, whom can “know the love of Christ which passes understanding”, and can “be filled with all the fullness of God” (Ephesians 3:19). Yet even though we can know Him in this fashion, so long as we live in these bodies, more is never enough. 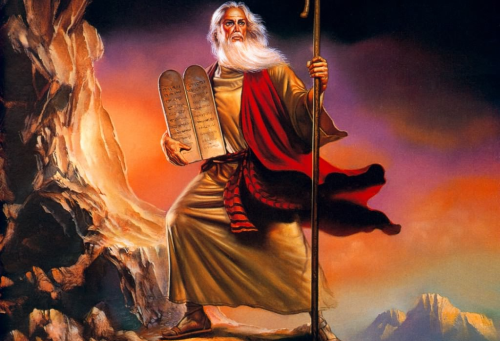 Are we like the Moses man of God? Are we fixated on Jesus Christ and God intoxicated, or are we settling for less? If we are not like Jesus, what is it we may be substituting for the knowledge and fullness of His glorious Person in our lives? (1 Thessalonians 5:23-24) Now may the God of peace Himself sanctify you completely; and may your whole spirit, soul, and body be preserved blameless at the coming of our Lord Jesus Christ. He who calls you is faithful, who also will do it. Although we hold this truth in great faith, the same letter reminds us of our part. This passage indirectly relates to the fullness of the Holy Spirit, consider that the disciples waited 10 days straight to receive the baptism in the Holy Spirit (the first filling with the Holy Spirit). Not only did they begin to live after Jesus life, they separated themselves or set themselves apart, for His purpose alone. Once more the man of God know that to satisfy His soul’s longing, he must encounter the Person and power of Christ, yet that can only happen as we sanctify ourselves, in order to receive this fullness by faith. This entails we be obedient in the extreme, as followers of His Glory in Christ Jesus. Finally we must learn that one man (Moses), moved the heart of God on behalf of an entire nation; a nation that was not inclined to know God as Moses was. The Israelite’s were generally afraid of God’s glorious Presence, in fact they wanted Moses to talk to the LORD on their behalf (Exodus 20:19). Quite frankly, the Israelite’s did not want make the necessary adjustments in their carnality, which were necessary to be separate commensurate to encounter God’s glorious Presence. Even still Moses plea, answered by God, would leave Israel a very near taste of God. The hope is that they would taste and see and fall to love for God as Moses did. In truth this has been at the heart of every great revival of the Church, throughout the ages. Are you so God intoxicated that you can be a flame to begin a reviving of the Church in this nation? God knows the church and the world need it. Moses chose God presence over the best that man could produce. Will we? This entry was posted in Exodus 33, God's Power, God's Presence, God's Promises, God's Word. Holy Spirit, Uncategorized. Bookmark the permalink.